Used attributively to designate things found in or associated with Connemara. Connemara marble a banded serpentinous marble. Connemara pony a small hardy breed of horse. Situated on the very western edge of Europe, Connemara is renowned for its bleak beauty and rugged campestral charm. Its name, Conamara in Irish, is derived from Conmhaicne Mara, meaning 'descendents of Con Mhac of the sea', after the branch of the Conmhaicne tribe that occupied this westerly portion of Ireland in medieval times. 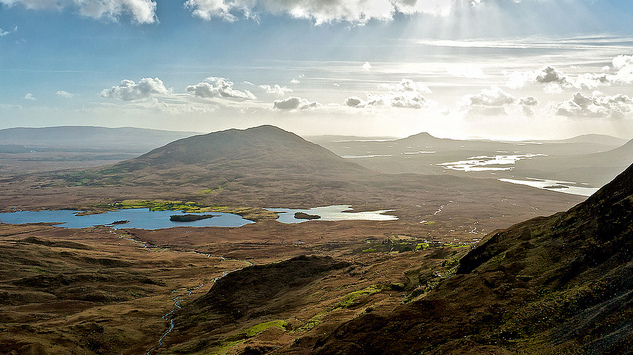 From the windswept sandy beaches that shore the Atlantic to the rocky peaks of the The Twelve Bens, the crystal lakes of Roundstone and the pitted blankets of richly-scented peat bog, Connemara is an enchanting and inspiring land full of history, beauty and adventure. Have you ever been to Connemara? Do please leave any comments in the box below. And then there's of course this one that shows up at every. single. party. ever. I can faithfully say that I've *never* been to a party where that piece of music was played. But you don't live in a half-French speaking country, so you're excused. Our partying is French in many ways. Anyhow, the dance is as follows: everyone climbs on the dancefloor/chair/table/bar/horizontal surface away from the ground. All grab a napkin from a table nearby and starts swinging it in circles above their head, quicker as the music goes faster, singing "lalalala" because who knows the words? It's a blast when everyone's semi to completely drunk, believe me. Accidents do happen. Play the Connemara with caution. As a general (grumpy) rule, I don't like it when people near me start swinging things above their heads because, being tall, I always get hit in the face. It's exactly the same reason I don't like crowd surfers, as my face always acts as their speed bump. Other than that, it looks a lot of fun. ....richly scented peat (bog) flavours, Connemara is an enchanting and inspiring Award Winning Whiskey which I am about to unearth from its box. Pure coincidence, but my step daughter, only yesterday brought me a bottle of Connemara Peated Single Malt as a present. You won't see this at a party; too exclusive. 'Connemara pony' is actually in the OED, but I don't know much about them, I'm afraid. Why Do We Say Things are 'Corny'? Cooties - What Are They? How Can You Avoid Them? Condemn - Forcefully Damn It! Codswallop - What Is This Old Nonsense?